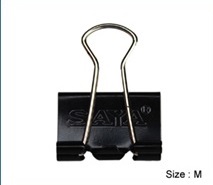 The versatile and handy Binder clips, we offer you, help lessen the clutter and restore order to your office. These are designed to keep your papers and documents together for you to access the right document as and when you need, without wasting any time. We avail you with a wide assortment of appropriate binder clips from trusted brands to select from. Available in different sizes and colours, these high quality clips have been designed to work across various strength levels so that you can find the best ones for your specific use. If you have only a few sheets to hold together, even a standard paper clip works fine, but in case you have a bigger bunch of papers that requires a safer and longer lasting hold, opt for any of these sturdy binder clips. Its heavy duty prong fasteners let you bind thick paper bunches temporarily. Order online to buy this amazing product at wholesale prices.